Bestech Square Mall Advertising in Mohali, Punjab is one of the best way to capture massive captive audience and engage them towards your brand’s advertisement. 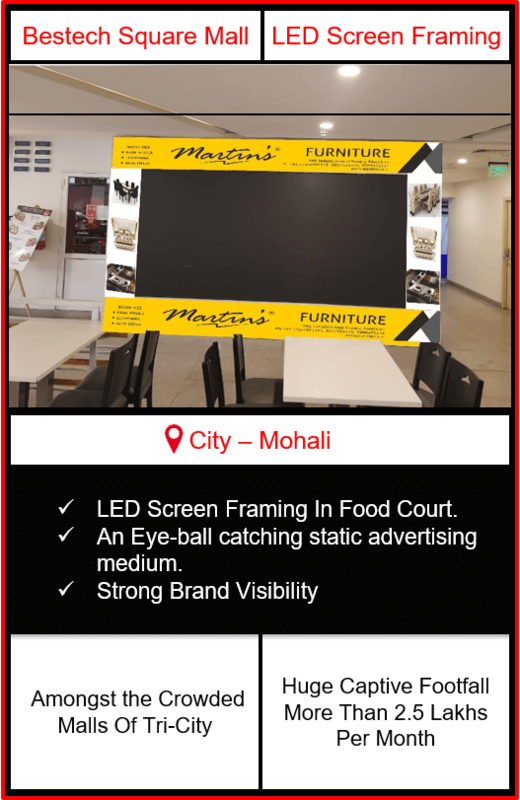 Advertising in Mall induces your brand to grab peoples’ attention which provides them the full overview of your products/services. Thus, offering an enchanting experience to your targeted audience about your brand. 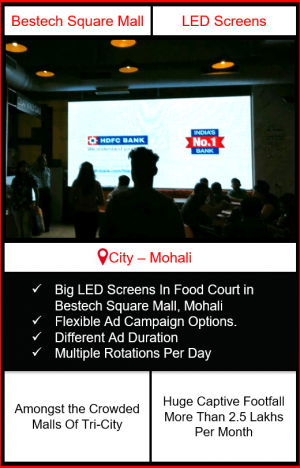 With variety of branding options in Food Court, Bestech Square Mall, Mohali gives your brand’s ad an opportunity to have Less Ad Avoidance. Unique Branding options in Food Court, lets your brand get high engagement rate providing Huge Brand Recall which in return offers you a Strong ROI. Advertising On Big LED Screen: With the enhancement in the technology, the ways of advertising and branding is changing. Bestech Square Mall fulfills the innovative advertising need with Big LED Screen Advertising. This advertising medium is the premium way of branding which enhances your advertisement and offers Zero Ad Avoidance with quality captive audience. Table Stickers Branding: Table Stickers Branding in Food Court of Bestech Square Mall empowers your brand to get your TG (Target Group) cover with the most engaging medium of advertisement in food court. 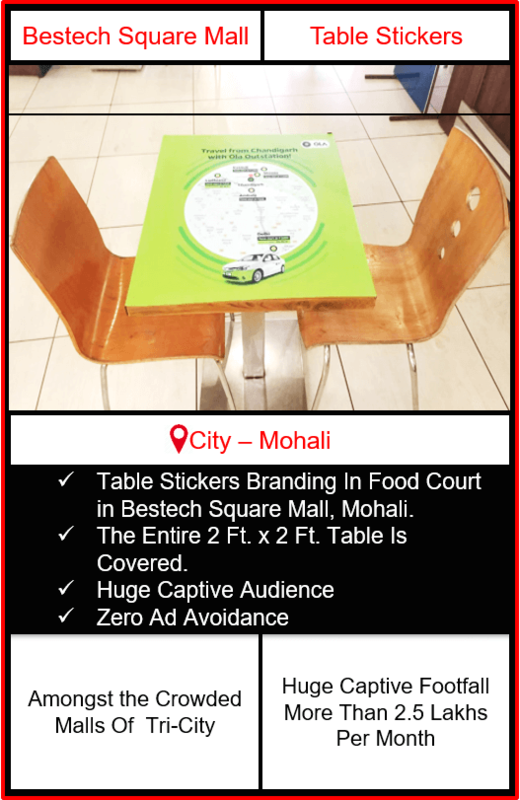 Table Stickers Branding provides you the attention of almost every single people visiting the mall as food court is the prime hub where people spend their leisure time. Stall Space Branding: Stall Space Branding is the perfect way to advertise and have a one to one contact with your target audience. 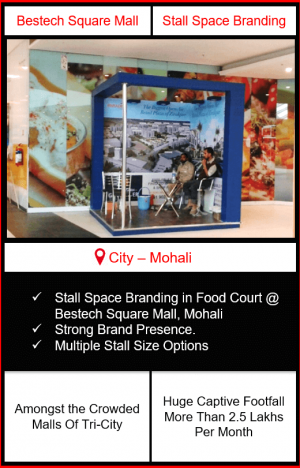 Stall Space Branding in Bestech Mall offers you an immense number of captive people through which you can strengthen your Brand Equity. Framing of Big LED Screen: What’s better than advertising around the most seen media in Bestech Square Mall, Mohali, that is, Framing of Big LED Screen. This static branding media let your brand advertisement allure peoples’ eye balls towards it which boost up your brand’s engagement power and offers Grand ROI.